"We call for adopting a strategy on the basis of resistance and the upholding of our rights and constants," Hamas spokesman Sami Abu Zuhri stated in an official message on Twitter. While statements in support of "resistance" may be old and established, Hamas' leadership is capitalizing on the social media craze to try reaching a new crowd. The power of social media hasn't been lost on Hamas. During the past year, young Palestinians in the Gaza Strip used Facebook, Twitter, and other similar sites to rally for a unified Palestinian government. The protests, which initially were suppressed, ultimately brought Hamas to the table with its Fatah rival, and were a Palestinian expression of pro-democracy movements in the Arab World. It's also not the first time that Hamas has used the latest technology in disseminating its message. In April 2010, the Hamas' Ezzedeen al-Qassam Brigades produced its first 3D video, focused on the failure of the Israeli government to secure the release of kidnapped soldier Gilad Shalit. Hamas' new push creates a web of ways to broadcast information. At the center is the news website Hamasinfo.net, which shows the latest speeches, statements, and information from Hamas' leaders. It also hosts important older speeches regarding the group's ideology. For example, to clarify the terrorist group's opposition to creating an Islamic Emirate in Gaza, the Information Office re-released a 2007 interview of leader Mahmoud al-Zahhar on Al-Jazeera Talk. New releases on its website are broadcast on Twitter and Facebook, where people can comment or link back to original articles and videos. More than 240 people have "liked" the official Hamas Facebook profile since its launch on May 15th. Hamas has also endorsed violent marches of Palestinian refugees on Israel's borders, in the "likes and interest" section of its Facebook profile. The group's Flickr page shows favorable pictures of its leadership, such as Hamas leader Khalid Meshaal meeting with senior political figures or attending Hamas rallies. Other pictures from its Facebook page show Meshaal visiting Palestinian hospitals. Its Youtube account, which is not yet fully functional, also will feature interviews and clips from the group's website. Through social media sites like these, Hamas can show two sides to its organization. On one hand, Hamas presents the image of a group with broad appeal, working for Palestinian unity, and rallying for independence. On the other, the speeches on its new website show that the group hasn't given up extremist positions, despite selectively omitting statements like Hamas' opposition to the assassination of Osama bin Laden. These include a recent announcement by spokesman Al-Zuhri that America is no longer a friend to the region and will fail to force it into ever recognizing Israel. 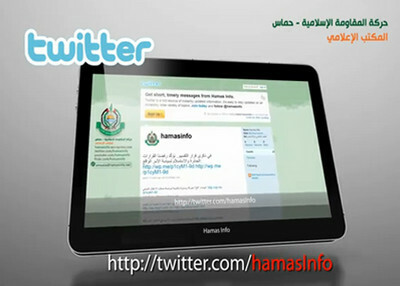 Before the launch of official social media, communication between Hamas members and the public relied on web forums. One such forum run by the Ezzedeen al-Qassam Brigades, Al-Qassam English Forum, continues to provide an official English-language outlet for discussion, multimedia, and advocacy on Hamas' behalf. It also includes photos of 'martyrdom operations' and videos honoring suicide attackers. However, unlike al-Qaida-style groups which thrive in the unregulated web forums, Hamas shut down the al-Qassam Forum's Arabic section last year. With little control over the message put out on these websites, many posts focused solely on jihad and hate towards Israel and Jews. Hamas hasn't lost the violent tinge to its writings, but its articles refer more to the "right of resistance," and other euphemisms for terror.